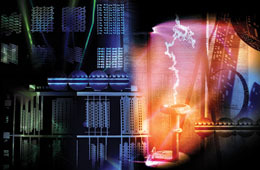 Cover image: Montage created from photos and research images highlighting the three eras of Electrical Engineering at Caltech: power, computing, and communications. The front cover shows a power arc created by a 1,000,000 volt testing transformer in the High Voltage Laboratory, as well as the corrugation of a semiconductor distributed-feedback (DFB) laser. The corrugation or grating was constructed to reflect only a narrow band of wavelengths. This unique feature of the DFB laser is the reason it is widely used in optical communication. The back cover shows a variety of computer chip designs in reference to the computing era and its great impact. 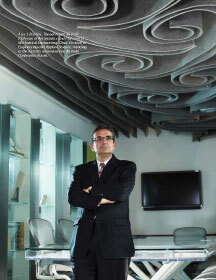 Above: Ares J. Rosakis, Theodore von Kármán Professor of Aeronautics and Professor of Mechanical Engineering; Chair, Division of Engineering and Applied Science, standing in the renovated Von Kármán Conference Room. 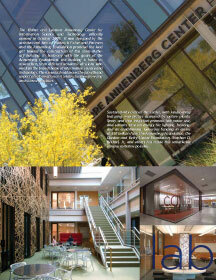 Inside back cover: The Walter and Leonore Annenberg Center for Information Science and Technology officially opened in October 2009. It was designed by the architectural firm of Frederick Fisher and Partners and the Annenberg Foundation provided the lead gift toward the construction of this state-of-the-art building. In harmony with the goals of the Annenberg Foundation, the building is home to researchers from different academic divisions who work on the broad theme of information science and technology. Their research addresses the growth and impact of information as it relates to all engineering and science practices. Sustainability defines the center, with landscaping featuring mini-plazas accented by native plants. Spray and drip irrigation promote low water use, and sensors save on energy for lighting, heating, and air-conditioning. Generous funding in excess of $50 million from the Annenberg Foundation, the Gordon and Betty Moore Foundation, Stephen D. Bechtel, Jr., and others has made this remarkable campus initiative possible.